1) He boasted he would “walk across the sky from one end to the other”. How can any reasonable person accept the boast which Sai Baba made several times, as shown in the quote on the right? “Formerly when the Govardhanagiri (mountain) was raised aloft by a little boy, the gopis and gopalas realised that Krishna was the Lord. 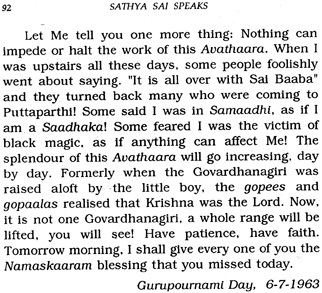 Now, it is not one Govardhanagiri, a whole range will be lifted, you will see!“ (Sathya Sai Speaks Vol.3 New Edition, p. 92) (also see scan from Sathya Sai Speaks Vol. 3, p. 106a). India is now known to be one of the most corrupt societies in the world, and Indians are very aware of it and the continuing degeneration in the years since 1968, as Anna Hazare’s huge movement has demonstrated to the world. Baba’s students may be entering positions of some influence, but if so, they are keeping quiet about it. “… the whole world will be transformed into Sathya Sai Organisation and Sathya Sai will be installed in the hearts of one and all.” (Sanathana Sarathi January 1999) page 16). 4) Various statements made in discourses by Sathya Sai Baba on vast increases in area size of the Prashanthi Nilayam ashram (to include Dharamsala, over 20 miles away) and the number of visitors expected for certain festivals were not fulfilled, the size and numbers falling far short of those predicted! 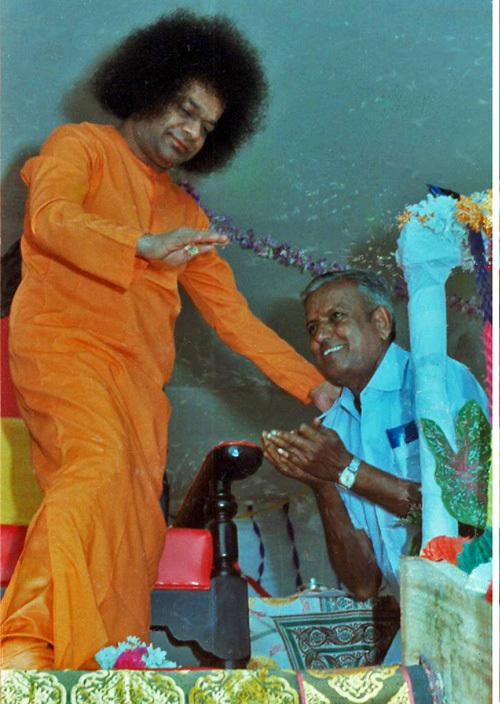 We heard some reports while at Prashanthi, independently confirmed from three ashram sources, that within the preceding year Baba had told students that the village Puttaparthi would soon be bulldozed away and that within 10 years Prasanthi would become enormous – 38 miles circumference. That was very hard to imagine in such a short time – much bigger than Bangalore itself!. But the area of Prashanthi Nilayam was very far from that before his death in 2011 and had expanded but very minimally in area in the last decade. 6) Despite this, Sai followers have repeatedly sent out scaremongering materials about interviews supposedly given by Baba telling of massive earth changes, the likelihood of a coming deluge, materialising maps and even globes of the earth showing drastic changes, the loss of major parts of continents and an entirely new North Pole position. Further, a number of residents at Prashanthi Nilayam have long circulated a list of 27 and more highly imaginative mostly catastrophe predictions around the millennium that Baba is supposed to have made to 18 students at Ootacamund before 1984. None of these predictions took place as stated. These are but a few of the more startling predictions made during his lifetime by Sathya Sai Baba. For a more thorough study, see here. One of the supposed miracles believed in by a majority of Sai devotees was denied as bogus by the US Sathya Sai organization (by Central Coordinator of the South American branch, Leonardo Gutter, who tried to confirm that such a plane problem occurred, without result after contacting all relevant airlines). The photograph is most evidently a put-up job by someone, as professional analysis of it proves.